Pride and Prejudice is, indisputably, Jane Austen’s most famous novel. (Fear not, we won’t use the Truth Universally Acknowledged bit.) When attempting to explain one’s obsession to the Great Unwashed, if the name “Jane Austen” is not sufficient for enlightenment, the title Pride and Prejudice almost always brings recognition. If the listener associates the title with Hollywood productions rather than the novel, well, that is the unfortunate part of being a 21st-century Janeite. Really well-done adaptations being thin on the ground at present, it rather increases our pleasure to encounter a quality production such as Pride and Prejudice: The New Musical. We (really we, the Editrix and fellow AustenBlogger Allison T.) attended the “concert performance” preview of the play at the gorgeous Eastman Theatre in Rochester, New York, this past Tuesday night, and even in its current developmental phase, it was as lovely and enjoyable as we had hoped and expected. Possibly even more so, as we had been told the concert performance would include minimal costumes and props. However, the cast was in full costume, the play was blocked out, there was choreography, there was a 17-piece orchestra from the Rochester Philharmonic, and though some of the cast members carried scripts, they rarely actively read from them, using them more as a backup. It was hard to believe such an accomplished performance was put together in only two weeks, though perhaps we should have had more faith in the cast of professional actors, most with Broadway experience. We love the conceit of adding Jane Austen’s writing process to the play. As an author, and having aspired to write for most of our life, we really identify with the concept of Jane Austen as a working professional writer. To see her accomplishment–creating a novel that has remained popular for nearly two centuries–so acknowledged, especially when recent adaptations have pretty much actively ignored her accomplishments, was almost overwhelming, and in fact brought your your tar-hearted dried-up purist spinster &c. Editrix to tears more than once. 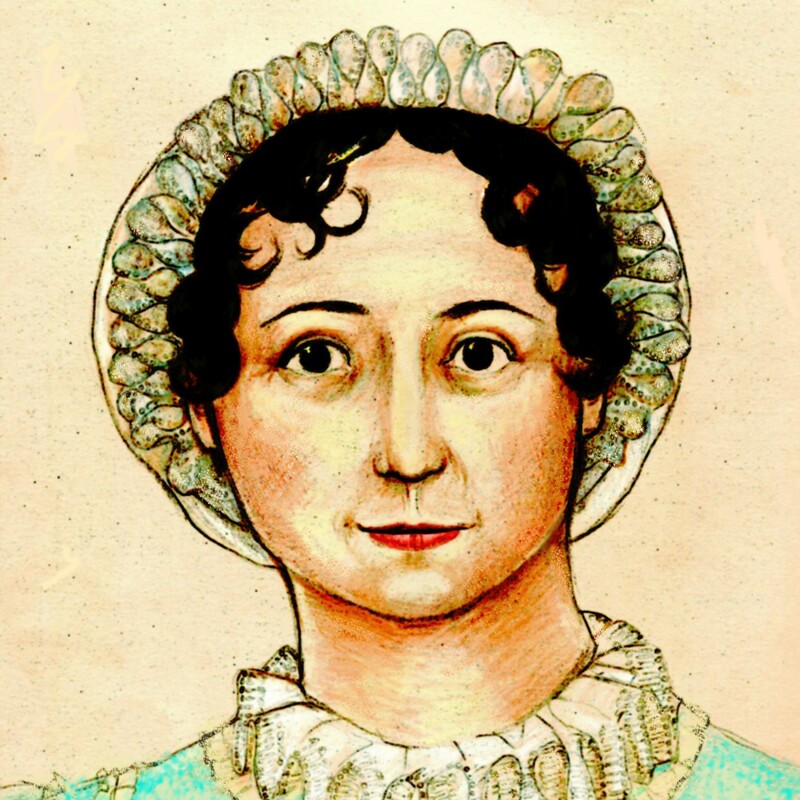 Not only is Jane Austen acknowledged as the author, she plays an active part in telling her story–and it is her story. Donna Lynne Champlin played Jane with intelligence, grace, and a great, knowing humor: delighted by her characters, occasionally surprised by them, letting them lead but never afraid to toss a metaphorical spanner in their works; singing that she will write about love, but getting thorough enjoyment out of the annoying and funny characters such as Mrs. Bennet, Lady Catherine, and Mr. Collins–as much as her readers will. Laura Osnes made a lovely Elizabeth Bennet; alternately teasing and thoughtful, her voice clear and strong. Her “big ballad” is “When I Fall in Love” (the retitled “Lizzy’s Song”), which got a huge hand and deservedly so, but for us she really shone while singing “The Man in the Portrait” during the scenes at Pemberley. Elizabeth has already realized that her first impressions of Mr. Darcy, reinforced by Mr. Wickham’s embroideries, were not quite right, and as she listens to Mrs. Reynolds’ praise of her master and looks at his portrait, seeing the smile that he smiled at her and knowing that it means he loves her, we see her journey to understanding. It is not a superficial journey, but comes from a deep emotional place; no one will ever mistake Laura’s Lizzy for a vulgar golddigger. It’s not Pemberley that brings her love, but when she learns to understand the real Darcy. We were already quite pleased by what we had heard of Colin Donnell as Mr. Darcy, and it was lovely to see him have a chance to truly expand the role in this production. In the first act, he was all Snarky McJerkpants, just as he should be; haughty, unwilling to be pleased, yet circling the stage thoughtfully, watching Elizabeth even when she is unaware; pleased in spite of himself by her teasing and her fine eyes. When they meet at Pemberley, he was all confusion; then concerned and determined to act when he learned of Lydia and Wickham’s elopement, telling the authoress, “I must get to London,” so authoritatively that she sent him off with some astonishment. And after learning from his aunt that Miss Elizabeth Bennet refused to say she would not marry him, he sang of his love’s fine eyes with hopeful joy, and–Mr. Darcy smiled. We like Mr. Darcy so much more when he smiles (not to mention when he stops being a jerk and gets all heroic and stuff). The comic pieces are a blast: Mr. Collins “aims to please,” with much vocal exercising and self-satisfied humility; Lydia Bennet dances with a half-dozen redcoats; Mrs. Bennet celebrates her nerves. The Netherfield ball is a lively dance number, punctuated with Elizabeth’s family embarrassments, and Bingley and Jane have their sweet romance, finding one another perfectly wonderful. The cast was great with no weak links. The playwrights, Lindsay Warren Baker and Amanda Jacobs, have done a masterful job at translating the novel not just to the stage but into music. They did it without turning it into modern pop, without dumbing it down, without Disney-fying it; certainly there are the expected big ballads and the comic pieces, but they’re all done with such intelligence and wit and care and emotion and deep knowledge of the novel that they are a delight. Our only criticism (and it seems to be one shared by most of the reviewers) is that the first act is a little long. But as Allison said, “What can they cut?” And the first act must end where it does–after Darcy’s first proposal. Allison suggested perhaps three acts might work better; but will the non-Janeite Broadway audience sit through a three-act musical? Perhaps not, and it is their misfortune. We hate to see any of it go, but we understand that the authors will be spending the spring with the director, Mark Lamos, further refining the show, so it is very much a work in development. It already is improved from our first experience of the show at a reading last summer, so we are all anticipation at how much better it will be when it finally hits the Great White Way. All we can say is–they got it. Everybody involved got it, the authors and the actors. They put their own spin and interpretation on it, but they got it. That’s so rare an accomplishment and so much more important than simple faithfulness to the text. That is what sets apart truly good film adaptations, even when they aren’t completely faithful, such as the mid-90s film and television adaptations; it sets apart the best paraliterature, even if they are not the most dramatic stories. It is a quality that is difficult to quantify and even more difficult to describe, which leads to the silly timewasting squabbling that sometimes goes on amongst Janeites, including here at AustenBlog. It is something worth supporting, and when it comes wrapped in such quality as Pride and Prejudice: The New Musical, it’s probably not surprising that we were brought to tears. It should also be mentioned that $1 of every ticket sold for this event–and going forward, even on Broadway and beyond–will go to “Jane’s Fund,” set up to strengthen the Rochester community through the arts.